RTL-SDR is a Software Defined Radio using a cheap DVB-T receiver with a chip from Realtek (RTL). It can tune to 868 MHz and show activity, which is really handy when you are debugging a LoRa node and need to figure out if it is actually transmitting anything. I bought the receiver from van Dijken Electronica at their stand at the VERON fleamarket for about 25 euro. It plugs into USB or a raspberry pi and the software is free (as in beer). 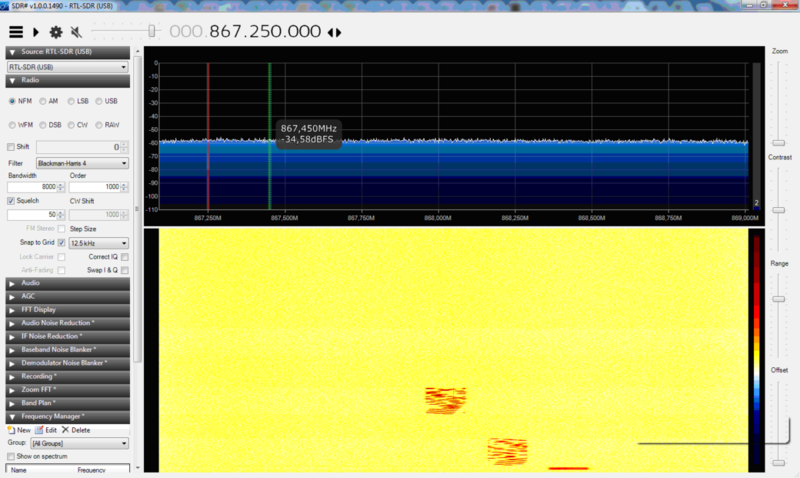 I use SDR# from Airspy. This is a couple of minutes traffic from a LoRa node building meetup. The top graph is the current spectrum around 868 MHz, the lower graph is the history. The fuzzy red rectangles are spread spectrum LoRa transmissions.